The classic White London taxi is an iconic British car and a real favourite for weddings. 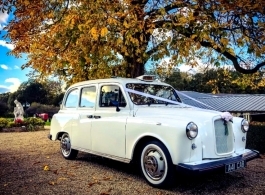 With lots of space and comfortable White leather seats this London Taxi is ideal for the bride and father to travel to the church or wedding venue and then for the bride and groom afterwards. With seating for up to 5 passengers, the London Cab is also great for transporting bridesmaids, family or guests.